Let’s take a look at some principles around suturing and wound care. Most of the time, the body is able to close a wound just fine, but sometimes a wound can be so big that a medical professional needs to suture the wound so that it can heal without leaving ugly scars. Optimal wound care aims at maximizing functional restoration as well as optimizing the aesthetic result. These goals must occur within the limits of maximum patient safety and patient comfort (a calm patient experiencing the minimal amount of pain and discomfort). Tight sutures will assist in controlling bleeding (securing hemostasis). It is not a substitute for normal bleeding control measures e.g. suturing or tying up (ligating) arterial bleeds in the depth of the wound etc. It reduces the chances of wound infection. A closed wound is much less prone to wound sepsis than an open wound. Further contamination from the outside environment is also reduced considerably! Reduced pain. An open wound leaves the severed sensory nerve endings open thus increasing pain. Suturing a wound will optimize the traumatized tissue’s chances of retaining its blood supply, and at the same time minimizing the formation of unsightly scar tissue. Primary closure – closure within the first 24 hours. Secondary closure – wound closure more than 24 hours after the injury. Primary closure of wounds should be the norm in most cases. Exceptions to the rule would be highly compromised tissue where the medical professional anticipates debridement of the wound (cleaning and cutting away dead tissue and-or foreign material) to be necessary. The above is an excerpt out of The Apprentice Doctor® “How to Suture Wounds Course & Kit. 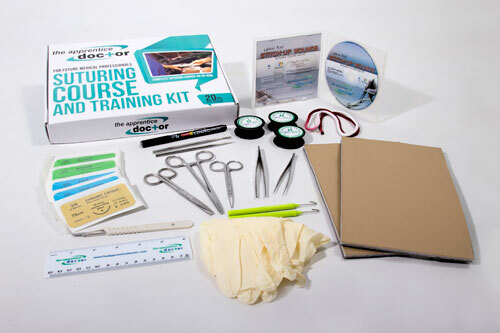 An incredible combination of a Step-by-step suturing course on DVD-ROM compiled by a surgeon with over 20 years of experience – and a Suturing Kit with all the instruments as well as 2 patches of fake skin – so you can really practice your newly acquired suturing skills!